IDEC offers a range of plastic enclosures for HW, TW and XW 22mm switches and pilot devices. IDEC’s plastic enclosures are available in three compact sizes and can be used to mount up to five 22mm switches. The FB Series plastic enclosures can be easily installed on panels, walls or frames. Featuring an outer depth of only 59.5mm, mounting the enclosures in confined spaces is an easy task. The polycarbonate cover and base with stainless steel screws makes them corrosion-resistant and durable for longer life. 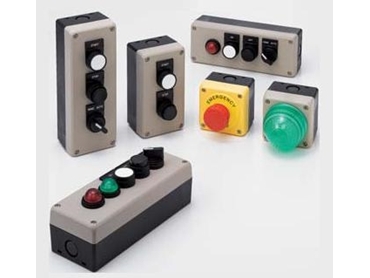 All switch enclosures are supplied in a beige colour but one-hole enclosures are also available in yellow, making them perfect for installing with HW, TW and XW emergency stop switches since the bright colour enhances their visibility, making them easy to locate in case of an emergency. All FB enclosures are also IP65 and NEMA Type 4X rated.